National Naval Aviation Museum in Pensacola, Florida. 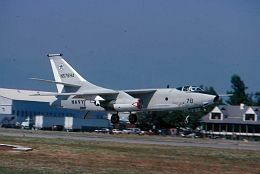 Designated as an A3D-2P, special Photographic Reconnaissance version aircraft and was the 206th Skywarrior of 283 built by the Douglas Aircraft Corporation in El Segundo, CA. Accepted by US Navy in December 1958 and assigned to Naval Air Test Center (NATC) Patuxent River, MD in 1959 for carrier suitability trials although it never trapped aboard an aircraft carrier. Modified by Grumman with a huge nose radome to house a five-foot Westinghouse radar antenna as a test bed for the Bendix AAM-N-10 Eagle missile to be used on a proposed Douglas F6D Missileer. The aircraft also gained the nickname as “Snoopy” due to this Radome installation. 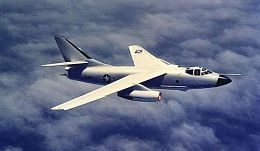 After termination of Eagle & F6D programs in 1960 the aircraft was assigned to the Naval Missile Center/Pacific Missile Test Center (NMC/PMTC) in Point Mugu, CA..
Redesignated as an NRA-3B in 1962 based on a common designation system by the Department of Defense. In 1990 the outsized radome was removed and replaced with a normal size radome from NRA-3B 144833. 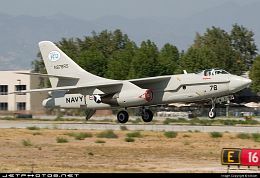 This aircraft was retired from the Navy in 1991 then bailed as US Government property to Hughes Aircraft Corporation. Used as a radar research & test aircraft at Van Nuys Airport, California under Civil registration N578HA. 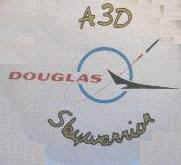 Hughes merged with The Raytheon Company in 1997 and continued to operate the aircraft under Civil Registration N878RS. 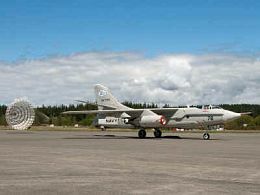 On 29 April 2011 this aircraft made its final flight to its permanent home at NAS Whidbey Island to be display at this site. 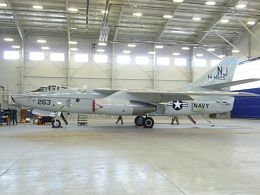 The aircraft was on display for the Centennial of Naval Aviation Celebration in July 2011 at NAS Whidbey Island. 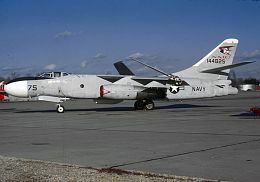 Restoration of the aircraft to its current configuration began thereafter utilizing numerous volunteers from the Naval Air Station, Squadrons, Support Facilities and the A3 Skywarrior Whidbey Memorial Foundation. This aircraft has been modified for display to resemble those aircraft stationed here during the 1950’s, 60’s and early 70’s. 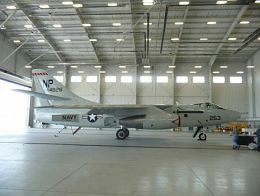 The aircraft was displayed for the VQ-2 Decommissioning Ceremony May 2012.